1 If present, remove the dust caps from the quick connect fittings at each end of the filter prior to installation. 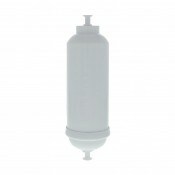 2 These dust caps are to protect the filter in transit and will prevent water flow through the filter if not removed prior to installation. 3 Install on cold water lines only. 4 This product should not be used where the water is microbiologically unsafe.